I had the pleasure of travelling back to my high school yesterday to compete in my third race of 2013 – the 123rd Annual Bemis-Forslund Pie Race at Northfield Mount Hermon School. 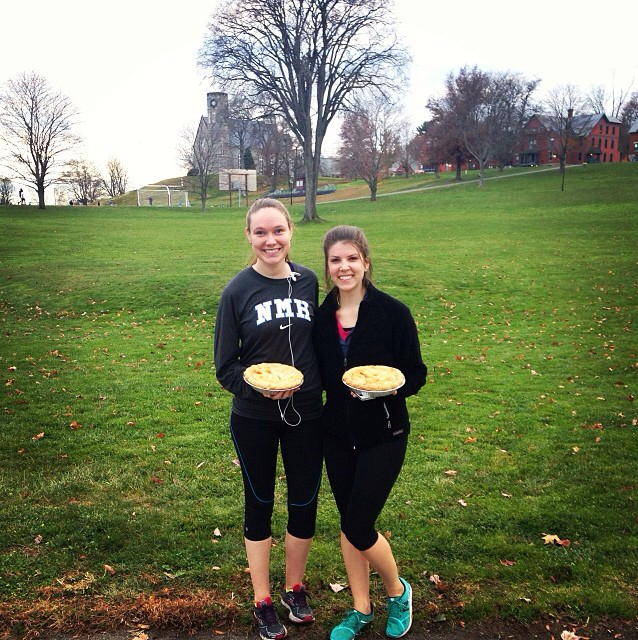 The pie race is a very special event in the NMH community. 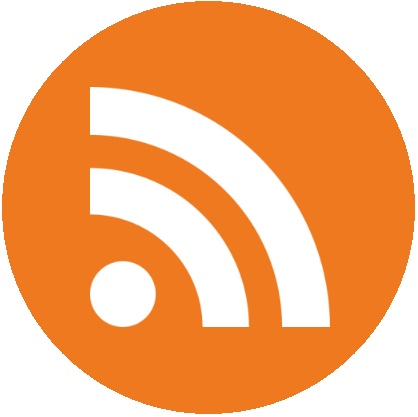 The 4.5 mile race is the oldest organized footrace in the country, dating back even before the Boston Marathon. It is named for its unusual finishing prize – a freshly baked apple pie for male and female runners who finish under 33 minutes and 40 minutes, respectively. Alongside Mountain Day and the Senior-Junior Rope Pull over Shadow Lake, it’s one of the oldest traditions in the school’s rich history. Tradition has always been important to me – it makes me feel connected to something larger than myself. Take the pie race for example: thousands, if not tens of thousands, of people have raced the same path in hopes of qualifying for a pie. The tradition brings us together across generations. It marks the passage of time and ties us to the values most important to us. NMH values the head, the hand, and the heart: which to me means expanding your world view, recognizing the value in hard work and caring for others along the way. As a student, I didn’t have quite the same appreciation for the tradition of the race. As a fall athlete (field hockey), I was required to participate in the race and felt expected to win a pie. I ran the race three out of the four years I attended NMH (I was injured junior year) and won a pie each time. It was pretty rewarding to hold that pie at the end of the race – it was the ultimate token of bragging rights. Because it had been so long since I had run the route (the last time I ran I was a senior in high school), I honestly didn’t know what to expect of the race. When we arrived on campus we drove what parts of the race we could. The middle portion (miles 3-4) are through the woods on a trail (more on that later), so we couldn’t get a good preview of that stretch. The race started at 3PM and we spent most of the day relaxing on campus extremely nervous for the race to begin – to come back as alums and not win pies would have been embarrassing! It was not unlike the social pressure we felt as high school students! The first mile of the course is a gradual incline ending with a long slow stretch of downhill into the second mile. The majority of the second mile is flat, but it ends with the longest and steepest hill in the race. After that, I thought the worst was behind me. I was wrong. The next mile and a half are through the woods on an unpaved trail. There is no better way to describe this portion of the race than “off the beaten path.” I have not run on a trail since the last time I ran the pie race and have been training on the sidewalks of Boston all year. With short steep inclines and rocks to maneuver around, it was very difficult for me. It was hard to know what to expect next. The final mile of the race is much more up my alley and takes you through a scenic portion of campus – around Shadow Lake, down Cottage Row (a line of small student dorms), around Memorial Chapel, and down a steep hill by the athletic fields. The final leg of the race is a very gradual incline to the finish line in front of the gym. Coming around the corner to Cottage Row you can hear the crowd screaming at the finish line. I turned the corner for the last stretch and was shocked to see the time on the clock at 35 minutes. I finished somewhere around 36 minutes –by the time I crossed the finish line the time didn’t matter. I won a pie! 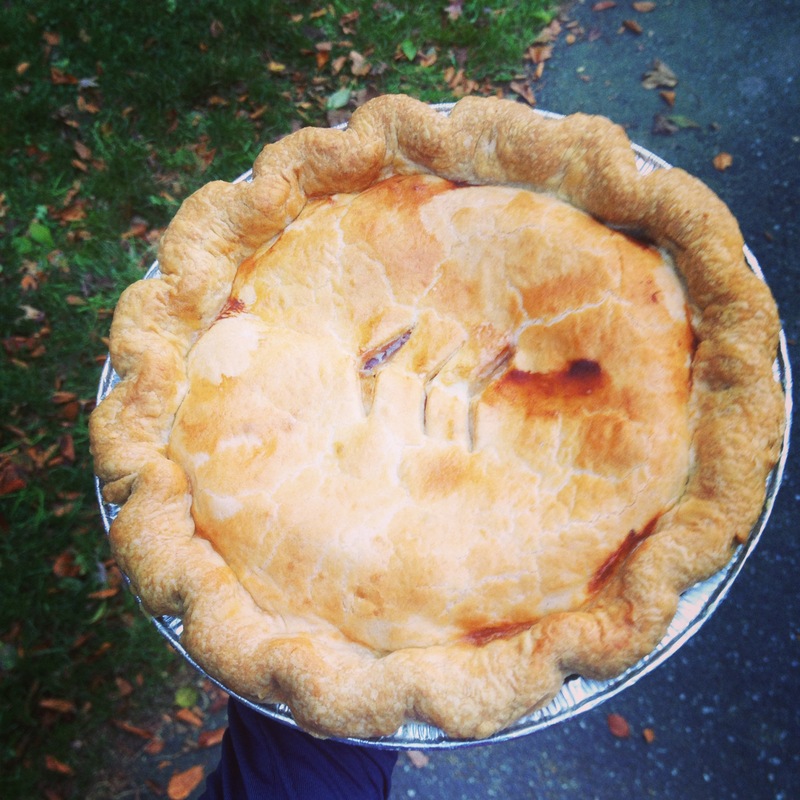 The misery of the trail run was behind me as I was handed that beautiful, golden apple pie. I am proud to have won a pie, but the experience really wasn’t about the race – it was about participating in a tradition with a community that I love and respect. Although many of the people who supported me throughout my time at NMH have since moved on – fellow students, teachers, coaches, and staff – the spirit of tradition and values of the head, hand, and heart are still present. What better way to celebrate than with a delicious apple pie! 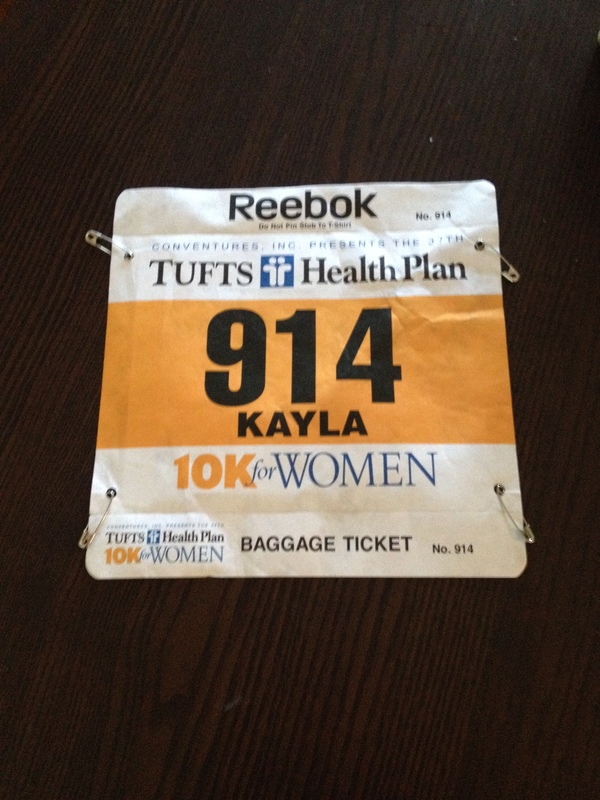 After 10 weeks of training, the day finally came – I ran my first 10k on Monday at the Tufts Health Plan 10k for Women! 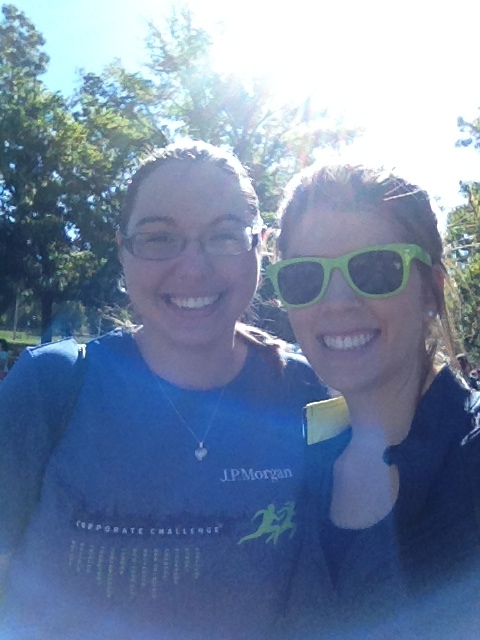 My coworker, running buddy, and fellow employee wellness enthusiast, Carolyn, ran the race with me. She and her boyfriend picked me up at my apartment early Monday morning to get to the race site in time to park, register, and warm up. I was surprisingly nervous! In anticipation of getting a good night’s sleep I had gone to bed early, but my nerves woke me up throughout the night. It was a beautiful day, sunny with a high in the upper 60s. It was cooler in the morning and I was worried about being cold during the race because I was shivering through our warm up jog. 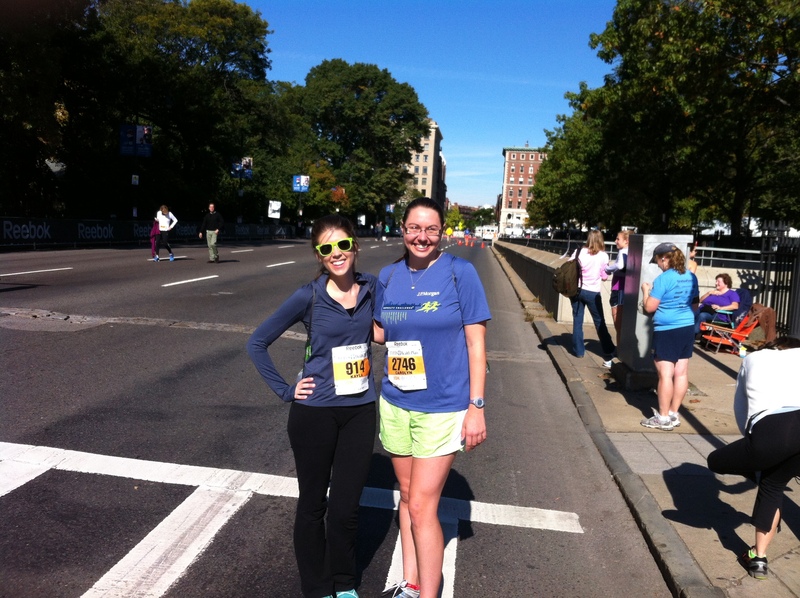 During the race, I wore a very light long-sleeved half-zip top with spandex shorts. Being that it was a primarily all women’s race (a few men joined in), the energy was fantastic. Lot’s of pink and purple and other bright colors, with some key Katy Perry songs playing over the loud speaker (Roar, anyone?!). 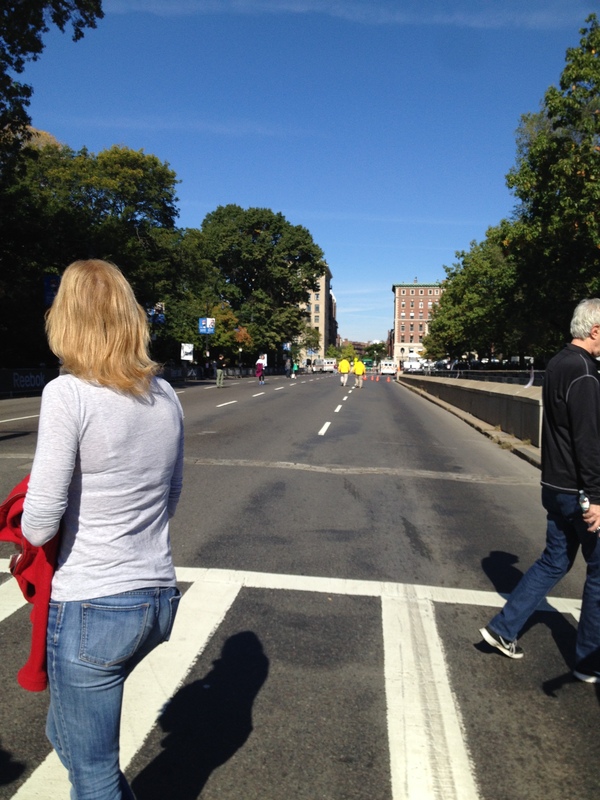 When called, Carolyn and I lined up with the 9-minute milers and waited in anticipation for the start of the race. We stayed together for the first mile and a half. 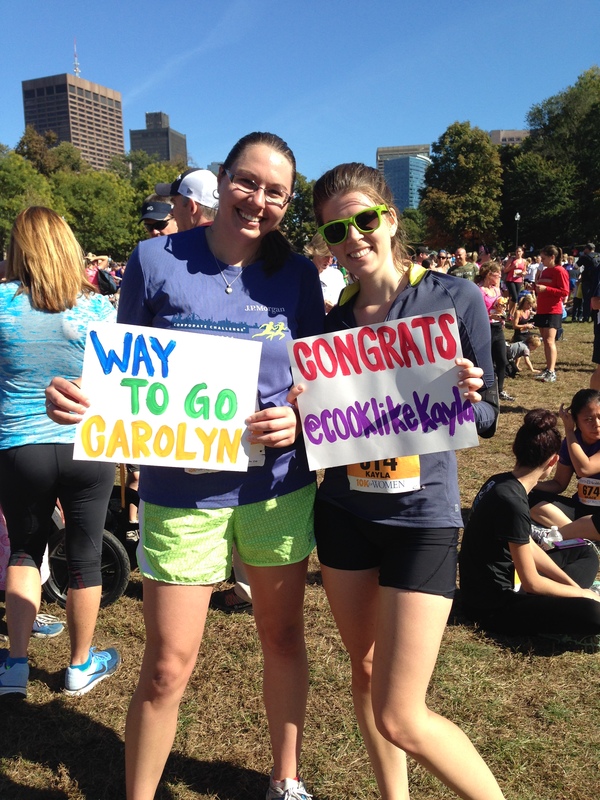 Carolyn was timing us on her watch, so we knew at the one mile mark that we were about 1:30 behind the clock. That was so helpful – at each mile I could get a good estimate of my time without having the check my Map My Run app on my phone in my arm band. The first two miles were a breeze, and I felt relatively good about the third until a slight uphill at the end. That was right around where I started to feel overheated. It was HOT for October. I was expecting it to be a bit breezy and cool around the Charles River, but the race started at noon and the sun was blazing. The cool breeze from the morning was gone. I started dumping the water at each mile down my back to stay cooler. I would have felt better at the end of the race if I had worn something lighter. The fourth mile was the absolute worst – a long stretch with no shade that felt like it went on forever! Next year I’ll know to pace myself on that one – or strategic place some friends there for extra motivation. I ended up beating my goal by 5 minutes and came in at 55:04. I was pumped (and apparently booking it)! 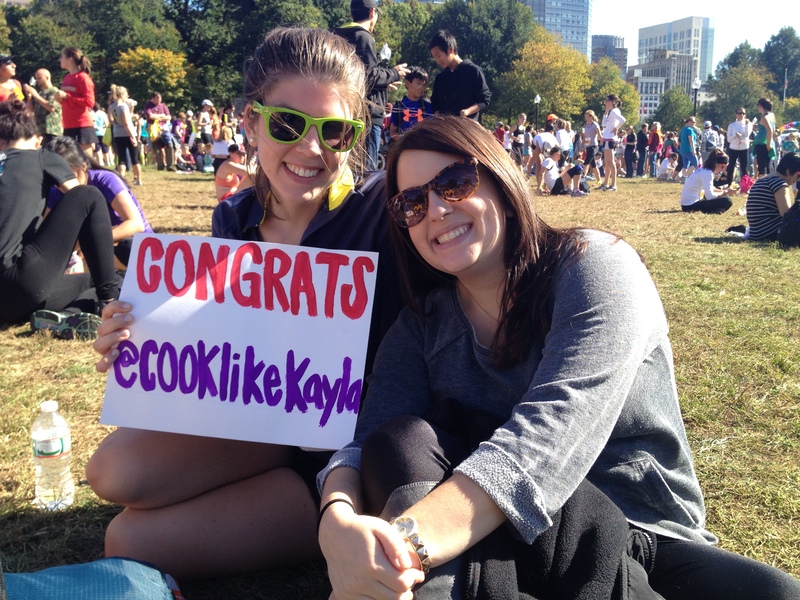 My roommate and her boyfriend met us at the finish line with the adorable sign above. I was touched by their thoughtfulness and so happy to see them at the end! We ate some of the great snacks (luna bars, bananas, gold fish, and chocolate covered bananas) provided by the race organizers and stretch on the grass in the Commons. We celebrated with a delicious brunch afterwards. I set this goal for myself at the beginning of the year, and it feels so good to accomplish something I’ve had my eye on for so long. It also feels good to not have to run that far for a while! 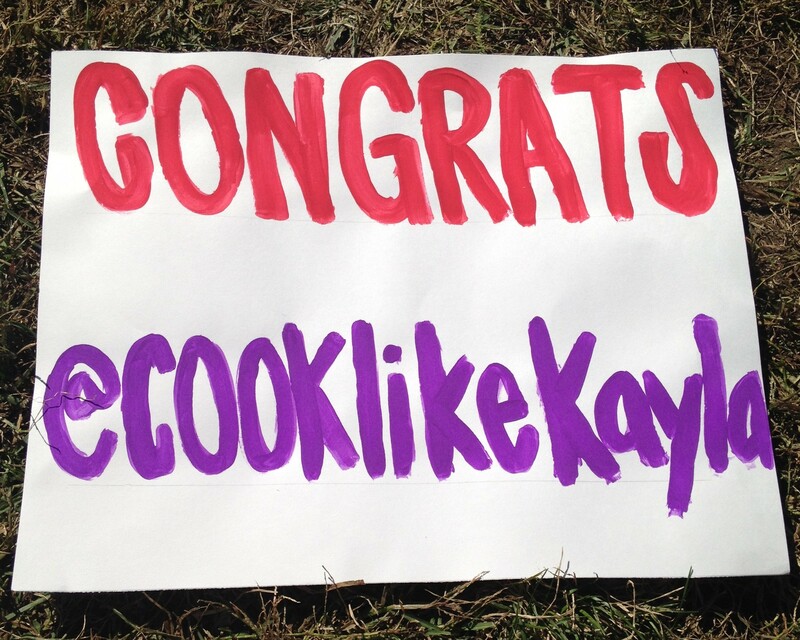 From left to right, top to bottom: 1) view of the finish line before the race, 2) my bib number, 3) Carolyn and I before the race, 4) me and the roomie and her amazing sign!, 5) I have a tendency of making Carolyn take selfies, 5) started strong, finished stronger!